How do you keep everybody happy, when you’re planning a narrowboat holiday? Mum wants to browse the shops in a pretty market town, the kids want to run wild through the meadows and woodland, and Dad just wants a quiet real ale in a country pub somewhere. But what if you could do all of these things and include a trip aboard a heritage steam or diesel train? Imagine relaxing in a restored wooden panelled coach or compartment and being taken back in time to the golden age of steam! 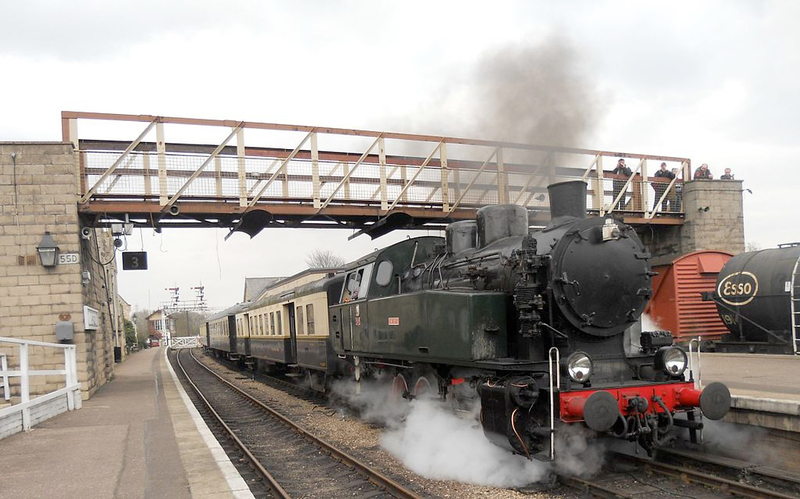 The Nene Valley steam railway is based near Peterborough, so you can easily include it in your narrowboat holiday. Foxboats Route 3 – March to Ferry Meadows Country Park is a 12 hours return trip and ideal for a short break. If you want to plan a narrowboat holiday that keeps everybody happy, and includes something a little different, you could consider a steam train trip in your holiday plans. The Nene Valley Railway line travels through a tunnel, (built in 1845,) to a country station at Yarwell on the Northamptonshire border. Visitors can use the train as a base to explore the stations at Wansford, Ferry Meadows with its country park, Orton Mere and its riverside walks and lakes, and the station in Peterborough. Setting off from our hire boat base in March, Cambridgeshire, you’ll pass Floods Ferry and the Greenwich Meridian, before heading on to Ashline Lock at the historic market town of Whittlesey. After leaving Whittlesey you’ll pass a couple of pubs and then head into more open countryside, travelling beside a deep brick pit. On the approach to Peterborough you will see the cathedral across the flat fields that lead to Stanground Lock. Peterborough Cathedral is the resting place of Katherine of Aragon and former resting place of Mary Queen of Scots, dating back to 654 AD. A short branch of the River Nene leads from this lock, with Stanground Village on the left and a nature reserve on the right, before the river goes under the railway bridge and onto the wide waters of the Nene. Turn left here to find visitor moorings along the length of the park; which are really convenient for the city centre. Carrying on up the river from the centre of Peterborough you will see a series of open spaces and wild areas on the right that are part of Nene Park: acres of meadows, lakes and woods running alongside the River Nene. Further up river from Peterborough Bridge, after some guillotine locks and the moorings of Peterborough Yacht Club, you will come to the entrance of Ferry Meadows Country Park on the left. Then, a short connecting channel will take you into Orton Lake. Head towards the left-hand side of the lake and you will see some pontoons provided for visitor moorings. Ferry Meadows is great for families, offering cycle hire, a visitor centre, shop, play areas, a miniature railway, walking, kite-flying, pony riding, nature-spotting and fishing as well as facilities for various water sports at the water sports centre and on its associated ponds and lakes. So perhaps you could moor here and then join the steam train at Ferry Meadows Country Park. There is a regular steam train service and occasional diesel hauled services. The NVR has just celebrated 40 years with a week of special anniversary events, with a number of special trains and attractions. You may like to visit the NVR website to find out about more upcoming special events and experiences. For more surprising and unusual tips and ideas for your narrowboat holiday, enter your email address in the box in the right side bar (‘Follow blog’) and we’ll send you articles direct to your in box.